Happy New Year! 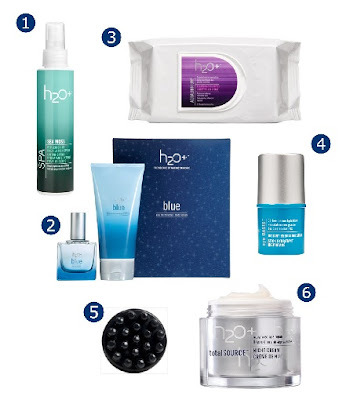 I love starting the new year by adding new skincare added to my regimen, including products from H2O Plus. Sea Moss Replenishing Body Lotion Spray ($19.50) - sprays on light as water but deeply hydrates and nourishes the skin with Irish Moss, Water Lily and Provitamin B. Blue Fragrance Collection ($29.70, originally $49.50) - set includes eau de toilette and body lotion, inspired by the infinite beauty of the sea, featuring the subtle and refreshing Blue fragrance with notes of water peony, rosewood, nectarine and bergamot. Aqualibrium Cleansing Face Wipes ($19) - oil-free cleansing wipes removes makeup and refreshes the skin with anti-oxidant marine algae, lavender extract and Provitamin B. Love this scent! total Source Night Cream ($95) - anti-aging marine infusion. The oil-free formula helps reduce wrinkles, firms, brightens, nourishes and protects with Pearl Extract, Yarrow Extract, Chestnut Rose and Rooibos.